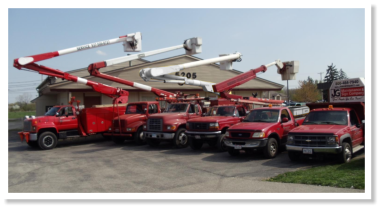 From our early beginnings in the 1990’s we have made our customers the focus of our efforts. By keeping a customer centered work ethic each day and using a business partner model, JG Sign & Services' sign shop is poised to become a sign industry leader in the cities of Dayton, Kettering and surrounding counties. Our services include sign maintenance and repairs, sign installations, and exterior lighting servicing. We also make custom neon lighting, and provide neon light repairs, as well as LED display signage and custom designed signs. Additionally, our sign shop produces custom banners, yard signs, sidewalk and floor advertising signs, real estate industry signs, commercial retail signage and cut-vinyl window lettering. We can wrap anything in full-color vinyl wraps, from buses, to firetrucks, to cars. Please visit our vehicle lettering and full vehicle wraps page to see examples of custom graphic and design services we provided customers with printed vinyl wraps. Exceeding customer expectations, providing value and keeping a strong sense of urgency for each customer interaction are critical to our continued growth and success. Tim and Judy Sheehy have over 40 years of experience in the sign industry and have worked to insure their customers receive the highest quality materials, products, and services with each and every project. As the owners of JG Signs & Services, Tim and Judy oversee the strategic initiatives, partnerships, and growth of the company. Together, they have maintained ever-increasing success in Ohio's sign industry by expanding their production and upgrading fabrication processes, offering clients quality customer service. Over the past decade the Tim and Judy have expanded their company into 6 cities across the United States and continue to expand as a result of implementing quality materials, industry-leading fabrication technologies, and an uncompromising customer-first corporate culture. Copyright © 2010-2014. JG Signs & Services. All rights reserved. All other trademarks are the property of their respective owners.